The Nortel IP Phone 2004 is a professional-level desktop IP Phone which is ideally suited for managers, knowledge workers and administrative staff. IP Phone 2004 supports up to twelve user-defined line/programmable feature keys* and comes standard with a large monochrome display which can support converged (voice and data) applications presentation in textual format, high-quality audio speakerphone, an integrated IEEE 10/100 Ethernet switch, context-sensitive soft keys and leverages a robust suite of business communication features as delivered by Nortel Communication Servers such as Business Communications Manager, Communication Server 1000, Communication Server 2100, Multimedia Communications Server 5100 and Meridian 1. 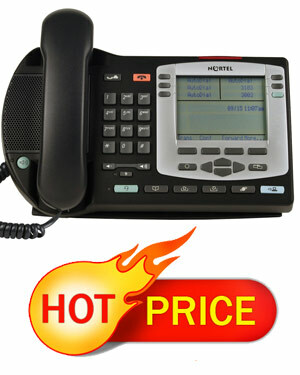 Call Telephonesonline NOW to get your hands on this Nortel Networks i2004 IP Phone! Established on October 1, 2000, Avaya Inc. is a multinational telecommunication company that operates mostly in its main headquarters located in Santa Clara, California. The company is also a leading provider of business communications and collaboration solutions under different specialisations, including contact centres, networking, small and midsize business, and unified communications. It has 10,000 employees under its management, with many distribution channels and partners all around the world. Avaya is an expert in unified communications. Its portfolio of solutions targeting unified communications helps users to integrate multiple communication forms like email, instant messaging, telephony, and video communication. These solutions are said to help enterprises reduce operational costs, improve customer service, and increase employee productivity. And these solutions can effectively work regardless of the location of the user and the device used. Part of this excellent portfolio is the Avaya Aura architecture. It helps cost-effective and rapid deployment of applications for efficient use. Telephonesonline Pty Ltd is an Australia-owned and –operated phone systems and handsets supplier and wholesaler. It started its operation more than 20 years ago, catering to all types of communication needs of customers of all types and enterprises of all sizes. The company offers the market with brand new and refurbished phones, widening its entire market to all customers. It is also consisted of many popular brands, even in refurbished, second-hand, and pre-owned conditions. Some of these brands are Alcatel, Avaya, Cisco, Commander, Coral Tadiran Telecom, Ericsson, Fujitsu, LG Aria, Hybrex, NEC, Nortel, Samsung, and Panasonic. Telephonesonline operates online. The company’s best distribution channel is its website- Telephonesonline.com.au. Customers easily visit the company’s site and order the items they need there. They would then be delivered with the help of its offices strategically situated all over the country.